"Hypermiling" or "to hypermile" is to attempt to maximize gas mileage by making fuel-conserving adjustments to one’s car and one’s driving techniques. Rather than aiming for good mileage or even great mileage, hypermilers seek to push their gas tanks to the limit and achieve hypermileage, exceeding EPA ratings for miles per gallon. Quoting Oxford, for its Word of the Year 2008. If you've never been on APH before, yes, this is an online technology publication -- but yes, this is an article relating to a driving practice that seems to have gained universal attention after insane gas prices earlier this year. That said, gas prices has dropped significantly for various reasons; mainly relating to the current economy. But lowering gas prices did not stop me from making the most out of my tank of gas. I drive daily to the train station, which would be around 25km round trip. The last time I filled up was more than a month ago in my 2007 Honda Civic LX 5-speed manual. Living in Canada, gas prices do cost significantly more than USA. Looking at it on the positive side, I gave my car slightly more expensive 87 octane gas (And plan to over the next few months, to see what kind of difference it makes) from a local Shell gas station instead of the usual the-cheapest-I-can-find, as some research indicates that different brands of gas may give better mileage. I'll post more on this in just a moment. Meanwhile, the bill came to $32 CAD. Not bad, not bad. Please note that the writer, Jonathan Kwan, and the publisher of this article, APH Networks, publishes this article as REFERENCE MATERIAL ONLY. We will not be responsible for the consequences, if it shall arise, of the reader following any of the published material below. Smaller cars are not always more efficient, and large vehicles aren't always terribly inefficient. Smaller engines might not always get fuel economy that larger engines may achieve. Ratings on the side of your vehicle may not be always correct either. In regards to government fuel economy ratings, in America the EPA conducts tests to see what kind of fuel economy a certain vehicle is able to get, while EnerGuide results published by Natural Resources Canada does it job up north. Revised EPA ratings are generally inaccurate, especially for smaller, fuel efficient vehicle -- MPGs are typically rated too low from what I can observe. Of course, it may be more accurate for some vehicles than others, but the general case is that it's usually rated a bit less fuel efficient than what you can actually get. For example, my 8th generation Honda Civic LX is rated 36MPG on the highway by the EPA, but in reality I can get equivalent of 38MPG (6.3L/100km) in mixed city and highway driving. Calgary is also a fairly hilly place, which negatively impacts fuel economy. When it comes to fuel economy, the first type of vehicle that comes to your mind might be hybrid vehicles. Common hybrid vehicles on the market today take advantage of a battery to store energy provided by the car's regenerative braking system. The basic idea comes down to how 'energy cannot be created or destroyed', where a portion of kinetic energy is converted into electrical energy and stored as chemical potential energy by the batteries. Hybrids and some other hybrid-labeled vehicles such as 'mind hybrids' usually have implementations of oversize starter motors that shut off your internal combustion engine when your vehicle's speed goes below a predefined threshold. Both an electric motor and internal combustion engine is part of your vehicle's drivetrain, and can either work together or simultaneously. When starting from a full stop, which has the greatest load on the engine, the electric motor kicks in and gets your vehicle going. This contributes to improvement in your vehicle's fuel economy, not to mention electric motors has instantaneous torque (And a load of them) that get your vehicle off the line a bit faster. Hybrid vehicles usually has narrow, low rolling resistance tires (More on this later) to improve fuel economy. Something like the Toyota Prius, with enough battery power, can go up to 50km/h on pure electric power alone, but the vehicle doesn't come cheap. However, depending on how much you drive, the cost premium for hybrid vehicles may not be always justified, as well as the fun to drive factor. For example, let's compare a Honda Civic LX and a Honda Civic Hybrid, which has essentially the same feature set besides the hybrid powertrain of the latter. It commands a $5000 CAD price premium over the standard Civic LX (You might get better government rebate, however), but saves only 2.7L/100km in the city and 1.1L/100km on the highway according to EnerGuide ratings. It saves 2.7L/100km in the city because of the fuel economy-optimized continuously variable transmission and the Honda IMA system, but only 1.1L/100km on the highway most likely due to its low rolling resistance tires. So are hybrid vehicles worth it? If you like to drive, or if you want to save money but don't drive all that much, it will take you a few years, or in my case, up to a decade. That excludes potential replacement due to wear on the battery (Normally Ni-Cd or NiMH batteries) after several years. The other alternative is diesel powered vehicles. If you think it's those loud, shaky, black smoke pouring vehicles, think again. 50% of all vehicles in Europe are diesel powered, simply for its superior mileage and immense amounts of low end torque. Of course, depending on where you live, the mileage advantage provided by diesel may be canceled out by significantly more expensive fuel costs. Like hybrids, the Volkswagen Jetta TDI also commands a relatively large price premium (Even with government rebates, depending on where you live) over gasoline Jettas, and with long waiting lists, more expensive fuel costs, and the such, you might want to take out your calculator and do some math once more. That said, despite what some might like to lead you to believe, many common vehicles on the road, besides the Hummer H2 and similar, does not actually use as much gas as you might think. Choose one that suits your need. Let's say a Honda Odyssey EX-L with Honda's VCM engine (The J35 V6 can automatically shut off a bank or two opposing cylinders on the highway to save fuel) uses 12.4L/100km and 7.8L/100km in the city and on the highway, respectively, as rated by EnerGuide. The minivan weights approximately 4500lbs. I own one, and the fuel economy certainly falls within that category. Compared to my Honda Civic LX 5-speed manual, which is rated at 7.4L/100km city and 5.4L/100km on the highway, that's approximately an extra 5L/100km city and 2.4L/100km on the highway. That's 0.05L/km and 0.024L/km, respectively. Converted to US liquid gallons (1 US gallon = 3.785L), the Odyssey according to EnerGuide -- which is more accurate than the EPA, in my opinion -- is rated at 19MPG city/30MPG highway. The Civic will then get 30MPG city/44MPG highway. For the city ratings, the 11MPG difference means 5L/100km, and for highway, 14MPG difference -- which is greater in number, but lesser in actual fuel consumption difference because that is only 2.4L/100km in that case. Remember that miles per gallon is not a linear rating (The higher the number is, the lower the difference -- for example, the difference between 8MPG and 4MPG is much larger than 80MPG and 40MPG). Liters/100km is a linear rating. So, calculate accordingly, and choose the vehicle that you actually need. Not every needs a Hummer H3, but not everyone can use a Civic for all their needs either. One size does not fit all, so choose wisely on your next vehicle purchase. A manual transmission or automated manuals (Dual clutch setups) provides better fuel economy than a conventional automatic. The reasons why automatics have better fuel economy ratings with some vehicles are based on many factors. But common sense is that it shouldn't be, right? How can having a car that weigh 40+ pounds more than a standard transmission, has a more inefficient way of transferring power with the torque converter, yield better fuel economy? For one thing, as car sales people would love to tell you, their company is making better automatics than ever before. It's true to an extent, but it still doesn't overcome the weight aspect -- adding 40 to 50 pounds to your car, no matter how good the torque converter is designed, will not be significantly better than manuals. New automatics are designed with lockup torque converters to reduce fluid coupling losses, but a clutch is always locked up -- with exception to it being in neutral/clutch depressed or being slipped. A modern automatic torque converter locks up when gear is engaged, but that makes it only identical in efficiency at the very best compared to a clutch setup. Regardless, cars with automatic transmissions are still heavier. Secondly, new automatics are usually programmed by the manufacturer to shift as early as possible to gain better EPA ratings. EPA's test setup allows the automatic to shift by itself in "Drive" mode as it is programmed to do, but on cars with manual transmissions, the EPA requires the tester to hold a gear until a certain RPM -- which makes up for its lower city ratings compared to the same car with an automatic transmission. For example, if a car is programmed to shift at 2000RPM with the automatic transmission, while the EPA requires the car with a manual transmission to shift at 3500RPM, which makes quite a bit of difference in fuel economy. The standard Drive mode in many of today's automatics are made to not shift aggressively, and rather get to find the highest gear as soon as possible. "Sport" and "Manual" modes are usually designed in place to get the performance back. In highway ratings, some automatic transmissions may have better rated fuel economy as well. This is because automatics may have different gear ratios than its manual counterpart. Take the 2009 Honda Fit, for example. The gear ratio configuration is different on the automatic than the manual. The final gear ratio on the automatic is much longer than the manual to get better fuel economy on the highway, by getting the engine to operate at lower RPMs. In the city, with a manual transmission, the user can easily match the shift times of its automatic counterpart to get better fuel economy, as the manual has weight advantages, as well as zero fluid coupling loss. With regards to dual clutch transmissions, they can be driven like a conventional automatic; but with better performance and same fuel economy as a manual. It costs more, however. CVT (Continuously variable transmissions) can also be driven like an automatic, with a programmed variable setting to allow an infinite amount of drive ratios within a finite range. This type of transmission isn’t usually favored by enthusiasts over a conventional automatic because they have much less driving feel. Some CVTs are programmed to behave like a conventional automatic, but with negligible improvement in fuel economy. Generally speaking, a car with a manual transmission may be a better choice for fuel economy, control, and fun to drive -- if you don't know how to drive one, it's definitely not hard to learn. It takes patience and practice to get it right. Cars equipped with manual transmissions are usually cheaper as well. Now that we've gone over that long section above, what can you do to improve the fuel economy of your current vehicle? The first thing is the weight aspect. The heavier your vehicle, the more fuel it will need to consume to move your vehicle from a full stop, and maybe a bit less significant compared to city driving when traveling at a constant velocity. This will impact small cars more than large vehicles, as the relative weight is more on smaller vehicles that larger ones. Either way, your vehicle consumes the most gas when starting from a standstill -- we'll go over this in just a moment. To reduce gas usage, take out every unnecessary thing inside your car; if it's not needed, just store it at a convenient location. Some drivers likes to place weights such as sandbags at the back of their car in the winter, but this is not necessary as it will alter your car's handling characteristics as well as using unnecessary fuel and room in your trunk. Good maintenance of your vehicle will also improve fuel economy. Routinely check your car's fluid levels and status, air filters, and related aspects do make a difference. Synthetic motor oil lubricates better, especially in colder weather, and definitely improves your fuel economy. A clogged air filter affects your engine performance as well. Make sure your car is properly checked and tuned. Keeping unnecessary things on top of your car will increase aerodynamic drag; again decreasing your gas mileage. Roof storage and removable roof racks should be taken down when not used. This is especially important when you're on the highway. Properly inflated tires are also very important in contributing to your fuel economy. Have you tried riding your bike with underinflated tires? I've done so before, and it's really tiring to do so. The same way it is with cars. It's normally acceptable to have the tires slightly above the manufacturer's specification printed on the label, but inflating it to the tire maximum is definitely not recommended. Overinflating tires may improve fuel economy slightly, but it will increase wear at the center of your tire tread, as well as decreasing appropriate contact with the road. Generally speaking, it decreases traction, and changes the way your tires are supposed to wear out. It's economically unjustified, and may impose a safety concern. Try using low rolling resistance tires, but they will negatively affect your car's handling and traction while saving a bit of fuel. It's safer than overinflating your regular tires, however. Different brands of gas may also affect fuel economy, but may not be necessarily true for every vehicle on the street today. Some cars respond differently to different brands of gas with regards to mileage, yet others take any brand you put in the tank. Try researching on various car enthusiast forums to see what brand is the best in your area, and put in several tanks of the same brand of gas (It may take about 4 tanks of the same brand to actually start making a difference) and record your fuel economy. Compare to recorded mileage to the cost of the gas -- since different brands may have different costs -- to see if this change is justified. Additionally, don't put higher octane gas than recommended in your vehicle, unless you have tuned your car and it is necessary to achieve desired performance. Another case would be some cars, such as the current generation Toyota Avalon with the 2GR-FE V6 engine, are designed to have its engine output slightly more power on premium fuel (268hp/248lb-ft with 87, 280hp/260lb-ft with 89). But that's only if you want the extra amount of power and torque. Otherwise, higher octane gas will not yield better mileage or power; it's simply a waste of money. With regards to cars that run on premium fuel, such as the 2009 Acura TSX, has the same engine as the I4 Honda Accord -- yet the K24Z3 on premium with the TSX produces 201hp/172lb-ft of torque, and the Accord on regular is specified 190hp/162lb-ft at the crank. The cars are tuned differently, however -- which makes it not identical in fuel requirement characteristics. It is possible to put regular fuel into a TSX. The ECU will slow the timings based on the knock sensor, reducing the engine's performance. Mileage might be affected as well, so again, do your math to see which is cheaper -- and if you want the extra 11hp. During the summer, it is also recommendable to fill up when your tank is near empty. That's because with less fuel in your car, your vehicle will be lighter, thus consumes less gas in return. However, keeping the tank full in the winter is highly recommended. This one is a big one. Driving at a constant speed increases gas mileage, as all of the fuel used is to get the engine to move your vehicle at constant velocity. This is as juxtaposed to 'normal' city driving, where a good portion of gas is used to accelerate your car. This causes more load on the engine to get your car to move faster; in return consumes more fuel. To conserve fuel, the first step is to plan your trip accordingly. Be familiar with which roads you are taking, what alternate routes there are in case of the unexpected, where and when traffic congestion starts to occur, and similar. Don't drive aggressively -- generally speaking, driving at a relaxed paced and giving yourself enough time to travel will allow the you to execute your hypermiling skills much more effectively. It's also about being safer on the road. As mentioned earlier, starting your car from a full stop consumes a lot of gas (This includes allowing your car to roll forward by releasing your brakes on an automatic transmission). Getting your car to accelerate from 0km/h to 60km/h will require more gas than going from 5km/h to 60km/h. Think of it this way: Let's say you are pushing a heavy cart full of rocks. If you're moving at constant speed, it doesn't require much work. However, getting your heavy cart full of rocks to move and stop repeatedly will tire you out a lot faster for the same amount of distance traveled. Keeping the momentum going is important in saving fuel. Therefore, it is important to avoid traffic jams -- start-stop traffic is not only a major waste of gas, but also a major waste of time. Try to avoid them as often as possible by taking alternate routes. Rat running is a common practice to save time and fuel, but may be lacking in courtesy to other drivers, or a disturbance to quiet neighborhoods. Do so only when acceptable and safe. As far as traffic lights goes, it is important to be familiar with the behavior of traffic lights you travel through (Or algorithmically determine the behavior of various traffic lights based on its location). The pedestrian crossing lights on the side is a good indication, but some are more effective than others. Some lights turn yellow after ten seconds, yet others don't change half a minute into the red hand appears. If you can guess when the lights change, you can continue moving without stopping at all. Stop as little as possible, ease off the gas when approaching lights or moving at the right speed to the light (If you're planning to go 20km/h to wait for the light to change, make sure you aren't obstructing traffic! ), or brake early if you believe you are approaching the light too quickly. Avoid routes with lots of traffic lights and stop signs. This will save you a lot of fuel in city driving. Not to mention your brakes will last much longer. If you really need to stop, and you know that the traffic light is going to be long (More than 20-30 seconds), it is advisable to turn off your engine, where legal. Modern vehicles do not have carburetors, and only requires the precise amount of fuel to get your engine running again. Some cars (All hybrids) stops and restarts the engine automatically for you, but many cars don't. It is easier to do this on manual transmission cars than cars with automatic boxes. For forward slopes and flat grounds, simply put your car into first gear, release the clutch, and the car will lock itself into place. When the light turns green, press the clutch down and get ready to start the car -- if the plane is forward sloping, your car will begin to slide forward. Don't start your car and accelerate hastily. Humans have a normal tendency to do so, but if the light is not long enough, you've saved no gas at all. For backwards slopes, use the handbrake -- it's better for your clutch and fuel economy, instead of letting it slide backwards. For automatic transmissions, it's a little more complex, because the process won't be as seamless. As the driver approaches a light and prepares to stop, slide the car into neutral, and hold the brake pedal, or pull the handbrake. When the light turns green, start your vehicle, put it into drive, and then release the brakes. Accelerate as normal. When going around corners, or following a turn on a highway ramp, try to corner as wide as possible, and brake as little (Or even none) as possible. Do cover your brakes at this point, especially during colder weather where this is generally not advisable, as your car has the potential to easily spin out. Do this only when you're confident, and thoroughly know your vehicle's handling characteristics. This is done to primarily reduce the loss of speed due to cornering, so the driver will not need to accelerate the car as much after the turn is completed. Always drive defensively. In cold weather, sometimes it is necessary to warm the car up. Modern cars do not require much time to warm up -- excess warming time only wastes fuel, but not warming the car enough may cause damage to your vehicle. In cold starts, usually a minute or two is the most necessary. Then drive your vehicle slowly, the fuel saving recommendations above are more than adequate. In areas that's very hilly such as here in Calgary, fuel economy is negatively affected. However, some aspects can definitely be taken advantage of. Some drivers puts their car in neutral to coast downhill, and holds their brakes to maintain the desired speed. This is essentially idling the engine (Since it's disconnected from the wheels), and causes unnecessary wear on the brakes. Modern fuel injection engines has a feature referred to as "deceleration fuel cutoff" -- where the momentum of the drive wheels drives the engine with the clutch or its lockup torque converter, without using any fuel. The engaged gear can also get the car to coast at close to desired speed, depending on the grading, gear ratio, weight of the car, and various other aspects. Unless you are taking advantage of gravity to accelerate, putting your car into neutral is generally not recommended. Generally, cars are designed be most fuel efficient at various legal speed limits -- observing speed limit may not always increase fuel economy, but adhering to traffic flow, as well as not driving aggressively will yield the best fuel economy. Driving faster doesn't mean it uses more fuel. Cars are usually most efficient at around 50km/h (~30mph) to 80km/h (~50mph), and mileage decreasing significantly at speeds more than 100km/h (~62mph). Knowing the most efficient engine RPM of your car, shifting at appropriate times for manual transmissions, and for automatics, traveling at efficient speeds, will get you the best mileage around town. Use cruise control where possible and most effective (Most cruise control systems don't work until you're going at around 50km/h). On the highway, optimal speeds counts for one, but here's the best one: Drafting behind large vehicles. Basically, on the highway, one fuel economy impeding factor is eliminated -- no full stop accelerations. The biggest fuel economy impeding factor is aerodynamic drag. This is especially evident with cars that has high aerodynamic drag; drafting significantly improves fuel economy. 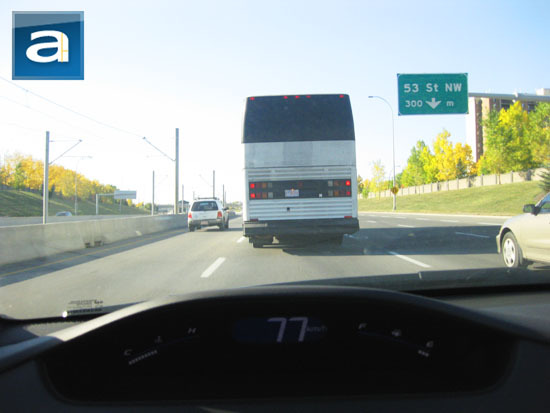 Following behind large trucks or buses are the best, but keep a safe distance. If possible, use cruise control -- but this is not always possible, as the vehicle you're drafting behind may not have their cruise control on Pay extra close attention to the large vehicle in front of you though -- it decreases your visibility, but normally it's okay since your vehicle probably has better brakes anyway. Large pickup trucks and SUVs are also acceptable choices for drafting, but do make sure that they know you aren't tailgating them. Drafting behind large vehicles improves fuel economy by decreasing drag, therefore lower load on your engine. On the highway, it is very helpful if you know which way the wind is blowing -- if you're going against the wind, drafting behind large trucks becomes extremely beneficial. If you can't find a good vehicle to draft behind, consider driving at slower speeds with cruise control on until you can locate a good candidate. As you may know already, turning on your car's air conditioner increases your engine load, therefore consumes more gas. It's generally better to open your windows in city driving. However, on the highway, opening your windows will increase aerodynamic drag, and on very warm days, opening your windows is not very effective in cooling either. Consider looping air inside your car, and turning your air conditioner on at low levels, activating the vents that affects you the most (Normally, the upper vents). Drafting behind large vehicles will compensate for the air conditioner. After all, driving has an enjoyment aspect to it, right? Here's the master-of-the-obvious advice: Drive less distance, drive less often. If your city has free parking lots near train stations, consider taking the train instead to avoid traffic jams, and save some gas. Take the bike for short distances, and combine several trips into one is the classic advice given by many people as well. A lot of time and gas can be wasted in parking lots as well, due to non-optimal travel speeds and potentially lots of starts and stops. Try parking closer to the exit, and avoid going around searching for spots if possible. This will make entrance and exists much faster, and saves a lot on gas over time. There are many safe, legal, and easy ways to maximize fuel economy in your car. Each methods requires some, little, or even no change in your driving habit, and after practicing the above for quite a while, it just seems to come quite naturally for me. I do it mainly for the fun and the pride, and with a great side effect -- saves me money. Others do it to save the environment. Whatever your reason is, hypermiling can be a fun sport, while saving you money. If you have any advices, please don't hesitate to let me know by sending us an email! posted 5 hours and 3 minutes ago, with 12 posts. posted 5 hours and 3 minutes ago, with 9 posts. posted 5 hours and 4 minutes ago, with 3 posts. posted 5 hours and 7 minutes ago, with 4 posts. posted 5 hours and 7 minutes ago, with 11 posts. posted 5 hours and 8 minutes ago, with 56 posts. posted 5 hours and 8 minutes ago, with 11 posts. posted 1 day and 21 hours ago, with 11 posts.